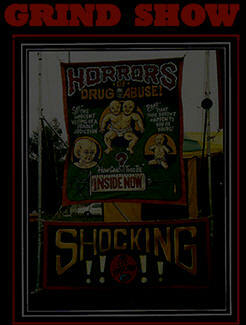 Side Show and Grind Show operators are almost always independent and don't generally consider themselves "carnies". They see themselves as real Showmen and rightly so. It is not the purpose of this book to chronicle every Side Show or Grind Show that has ever existed throughout history. There have been far too many of them and the nomadic nature of the carnival industry makes it nearly impossible to keep track of the numerous shows and personnel that have criss-crossed this country over the long years that this particular type of entertainment has been around. It is also not my intention to delve deeply into the Circus Side Show, Ten-In-One or so-called Freak Show. This kind of show covers a lot of ground and the recent interest in Human Oddities has produced more than a fair share of books, posters and even trading cards (called FREAKCARDS). Besides, it is not this type of show that I am most interested in. I love the Grind Show. A Grind Show is a show that, regardless of what it exhibits or how it is housed, grinds away endlessly hour after hour bringing in the dimes and quarters without a break. It is an exhibit that never ceases operation, does not have show times and usually begs a lower admission price than the bigger tent shows. It is said a Grind Show owner makes his living a nickel at at time. Grinders are often Single-O attractions and many times the exhibit is not alive - and may never have been! Sometimes the exhibits are complete fabrications and bogus hokum. ET. Barnum was a great one for exhibiting creatures that never really existed. Replicas of his famous Fiji mermaid (a taxidermied monkey sewed onto a fish body) is still being manufactured and displayed to this day! Grind Shows usually require very little personnel to operate them. Sometimes only one person is needed to set-up and start selling tickets. Some shows, like the Gorilla Girl illusion require a small army to set-up and operate, but never as many as the Ten-In-One Show, even though as few as four performers sometimes make up the "ten" Side Show acts - the Rubber Girl doubling up (so to speak) as the Electric Girl and maybe even as the target for the Knife Thrower! This single-minded independence is attractive to certain showmen and certainly costs less than the housing and boarding of Side Show performers (a Fat man can eat a lot if he puts his mind to it! ), thus requiring less of an overhead operating expense and making its profit much quicker and cleaner than a big show.